Facilities management is an enabler of sustainable enterprise performance through the whole life management of productive workplaces and effective business support services. 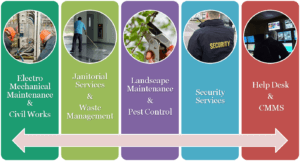 Secur Cleaning & Hygiene Solutions was established in November 2011. Healthcare – hospital cleaning, CSSD instrument washing. Transport Sector – cleaning of all areas in bus stations and train stations etc. Personal hygiene is equally important in the office as what it is in the home to both employees and customers. Apart from being a public health issue, clean, hygienic toilet facilities can have a positive impact on users and their attitude towards your business or organisation. Deep cleaning – reaching and cleaning those often neglected places in urinals, shower drains toilet pans and rims, cleaning of kitchen drains and hand basins as well as odour prevention.